The Time Is Now for a Labor-Based Political Party! The 2018 mid-terms have come and gone. As expected, the Democrats took back the House, while the Republicans widened their majority in the Senate. Congresswoman Nancy Pelosi called it a “great victory” for working people. But was it really a “victory” for working people? Hardly. “The blue wave is a corporate wave that has swept in the same kind of Democratic politicians that drove working people into Donald Trump’s arms after eight years of Obama,” stated the November 7 press release of the Movement for a People’s Party (MPP). If anyone thinks that these House Democrats are going to succeed in any significant way to reverse any of Trump’s right-wing policies, think again. Pelosi’s remarks were met with strong opposition from many Democratic Party activists. “Trump and the Republicans will continue to stoke white America’s fear of a Black and Brown country until they stop drawing breath, but at least we’ll be armed to hilt with, uh, the ‘bipartisan marketplace’,” wrote Katherine Krueger in the Nov. 8 issue of Splinter magazine. 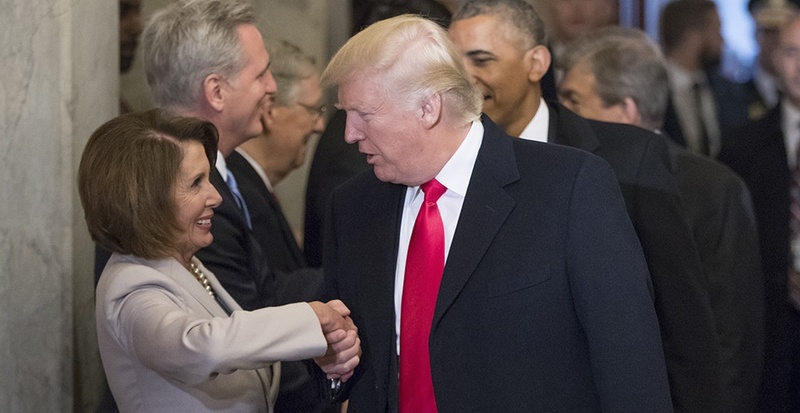 For his part, Trump immediately replied to the overture by calling Pelosi, praising her publicly, and then tweeting that she should be the Speaker of the House now that the Democrats had taken it back. taxation [agreement on a new rule that would require a 60 percent majority to pass any policy that would raise income tax rates on the bottom 80 percent], among other things. If Pelosi wants any of the Democrats’ proposals to pass, she will be compelled to horse-trade with the Republicans, who will demand, in exchange, cuts to Medicare, Medicaid, food stamps, housing, education, and other programs. The Democrats will also be asked to water down their proposals. Pelosi’s “bipartisanship” will likely be a set-up for Democratic failure in 2020, Rasmus concluded. But What About the Efforts by “Progressives” to Reform the Democratic Party? “The 2018 mid-terms offered another test of the progressive movement’s chief strategy for coming to power: taking over the Democratic Party. The results are a serious wake-up call. “The four leading progressive organizations that emerged from Bernie Sanders’ 2016 presidential campaign endorsed Democratic candidates across 46 states. Nearly all of the candidates for Congress, governor, lieutenant governor, and Senate lost. “Our Revolution, Justice Democrats, Brand New Congress, and the Democratic Socialists of America endorsed a combined 107 candidates for Congress this year. Forty-four of them won their primaries and only 12 won their general elections. Five of those 12 were already incumbents. Five more of them were longtime party politicians in line for higher office, rather than insurgent candidates. Only two of them were actually opposed by the party and unseated establishment Democrats in the primaries — Alexandria Ocasio-Cortez and Ayanna Pressley. There are 435 members of Congress. The “blue wave” that emerged across the country simply swept in more corporate Democrats. Only they had the backing of the party establishment. We are living under a capitalist system in crisis — a system that only knows how to stem its growing crisis by fueling speculation and war spending, on the one hand, and by slashing workers’ wages and working/living conditions, on the other. We’re in this dire situation because the capitalists have been able to count on their twin parties — the Democrats and Republicans — to do their bidding over decades. To beat back this racist and anti-worker offensive by the employers and the politicians in their pay, we must build democratically run coalitions that bring together the stakeholders in labor and the communities of the oppressed, so that they have a decisive say in formulating their demands and mapping out a strategy. The Labor-Community Campaign for an Independent Party was established to run independent labor-community candidates beginning in 2019 at the local and state levels, as a step in the effort to build a new independent mass Labor-based political party. The platforms of these independent candidates need to be discussed and approved by labor-community assemblies, and the candidates must be answerable to these assemblies and to the coalitions formed for this purpose. This is an essential component of the effort to build working-class power. The candidates and the coalitions themselves cannot be limited to electoral politics; they must be fighting for the issues contained in the platforms, projecting these struggles into the electoral arena. This will help to cement the alliance between labor and the oppressed communities. The LCCIP was also established to make every effort to promote the launching of a new committee advocating for a Labor-Based Political Party. It will seek to promote this discussion in our unions, through discussion groups and union resolutions, based on the September 2017 resolutions calling for a break with “Lesser of Two Evils” politics adopted by the national convention of the AFL-CIO. Please join us in building an independent, labor-based political party that serves the interests of the working class and all oppressed people. Please endorse the LCCIP platform by contacting us at <theorganizer@earthlink.net>. America has a long history of voter suppression that it seems to be comfortable with, as long as the veneer of democracy — the performance of an election — is in place. In 1946, Black veterans were returning from fighting Nazis and fascists and were determined to experience for themselves the democracy that they had waged war to secure for Europeans and Asians. Coming home to the United States, they wanted to vote. Duly incited, the violence rained down on Blacks as Bilbo won the all-important primary in a one-party state. A group of African Americans then petitioned the U.S. Senate to unseat Bilbo because, during the election, armed white vigilantes had threatened to kill Blacks trying to vote, officials had refused to register African Americans, and other forms of intimidation had clearly discouraged “enough Blacks from voting to affect the outcome of the primary,” where only 200,000 votes were probably cast. This was particularly important because in a state with 350,000 voting age-eligible African Americans, only 5,000 were registered and barely half of them were able to vote. Yet, even when directly confronted with virulent, obvious disfranchisement, the U.S. Senate stalled its way into a stalemate. That august body could not come to a consensus that an election was illegitimate, stolen even, because a candidate and state laws had deliberately blocked American citizens from voting. Bilbo maintained his seat. The Florida 2000 election, for example, is best remembered for flawed ballots, hanging chads and a short-circuited recount that handed the presidency to George W. Bush. Yet, Secretary of State Katherine Harris’s purge of 58,000 alleged felons from the voting list was decisive. This year’s midterm in the Sunshine state has that same haunting feel. A recently passed grassroots-generated ballot initiative will restore the voting rights of 1.4 million returning citizens with felony convictions. But they weren’t able to vote in 2018 and, equally important, Governor Scott had seen to that. He balked at a court order this spring to open up the voting rights restoration process that his administration had throttled down considerably from the one used previously by his predecessor. Therefore, as the battle rages in Florida with no one really talking about the consequences of and inability to count suppressed votes, the U.S. electoral system simply ambles along as if it’s never seen anything like this before while continuing to reward those who strip American citizens of their voting rights. If this continues, democracy will soon be a ghost, too. Working people at home and abroad have a hard time understanding how a country that claims to be the world pillar of “democratic rule” — and that sends U.S. troops across the globe to kill and maim millions of people in the name of “promoting democracy” — can witness a presidential candidate, namely Hillary Clinton, win a presidential election by 3 million votes but be denied the victory because of another anachronistic institution inherited from the days of the slave-owning South: the electoral college. When given a choice to express their demands directly in referenda, unmediated by capitalist politicians, voters in a number of states pushed for progressive legislation. Restoring voting rights to felons in Florida and expanding Medicaid to the poor in Maine are two of the most positive examples of this development. Voters in Florida approved a constitutional amendment to automatically restore voting rights to people with felony convictions once they complete their sentences, a historic move expanding the right to vote to about 1.4 million people that reverses a state policy rooted in the Jim Crow South. Florida is one of four states that prevent people with felonies from voting, even if they’ve completed their sentence, probation and parole. The 1.4 million people in the state who have been disenfranchised by that policy represent an estimated 10 percent of Florida’s voting population and a quarter of the total disenfranchised population in the United States. Florida started barring felons from voting after the Civil War as Congress forced states to ratify the 13th and 14th Amendments guaranteeing all men the right to vote. Blocking felons from voting while also passing criminal codes that targeted Black people was a strategy to keep Blacks from the ballot box. Voters in Maine approved a ballot measure on November 6 to allow many more low-income residents to qualify for Medicaid coverage under the Affordable Care Act. The vote was a rebuke of Gov. Paul LePage, a Republican who has repeatedly vetoed legislation to expand Medicaid. At least 80,000 additional Maine residents will become eligible for Medicaid as a result of the referendum. According to The New York Times, Maine will be the 32nd state to expand the program under the health law, but the first where voters, not governors or legislators, decided the issue. Other states whose leaders have resisted expanding the program were closely watching the campaign, particularly Utah and Idaho, where newly formed committees are working to get Medicaid expansion on next year’s ballots.